The Regiments of Foot Guards. As troops of the Royal Household, and responsible since their inception for the British Sovereign's personal protection, the regiments of Foot Guards have always had their own dress distinctions to mark them out as superior in status to the regiments of the British line infantry. 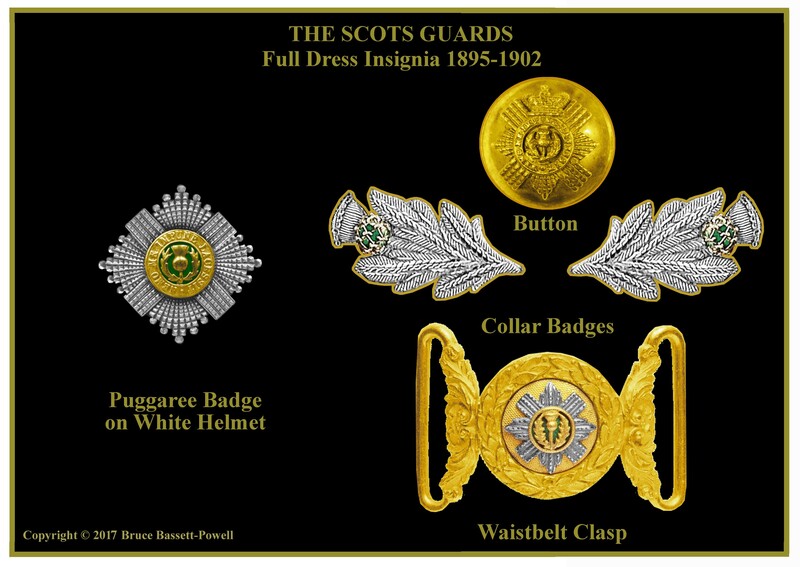 In general this has involved uniforms of a finer quality cloth, more richly embroidered with gold lace and embellished with the finest of gilded and silvered insignia. The dress uniforms have always had a unifying element between the regiments of Guards, in order to convey a discrete and unique body of elite troops, and dress differences were relatively subtle, so that the overall impression was one of elegance, as well as smartness. Although not the first British regiments to wear a bearskin, from 1831 that style of head dress became the uniform head dress across all the battalions of Foot Guards, rather than just the Grenadiers, and when the blue, universal helmet and associated insignia was issued to most of the line in 1878, the Guards retained the simpler, instantly recognizable and more imposing appearance of their bearskin caps. 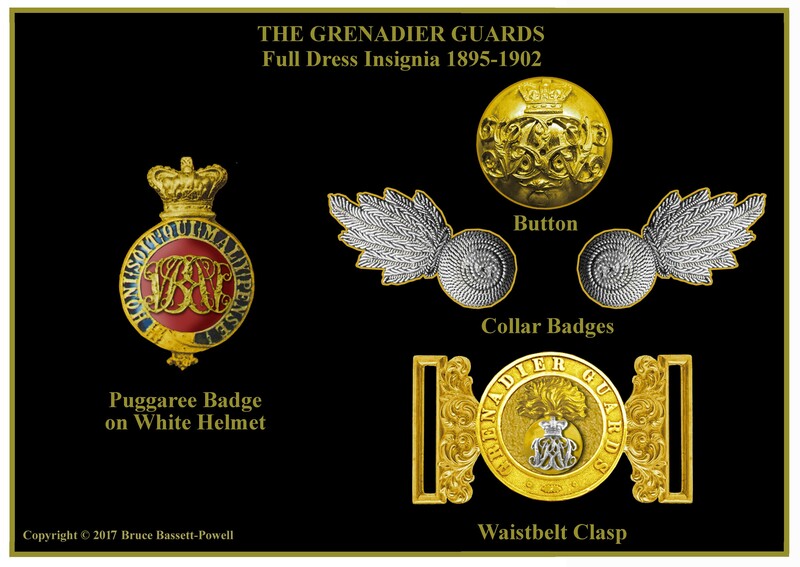 Similarly, the Foot Guards collar badges and buttons retained a distinct elegance, with less detail and more simple lines than those utilized by other regiments of the British Army, who had often had to merge the icons of militia and regulars into items as small as a button. 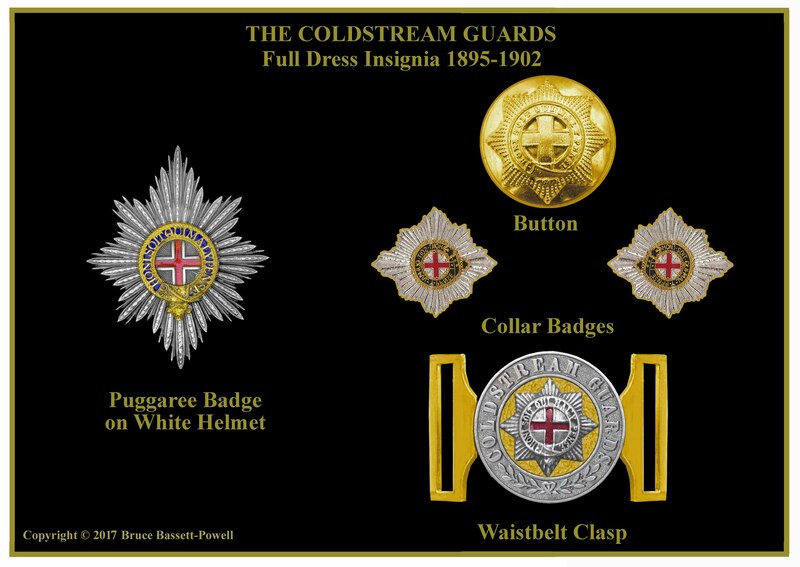 In short, the Foot Guards had separate and unique regulations for dress and insignia, and it is for that reason that they appear here in this appendix to the series on Full Dress Insignia of the British Army 1881-1890. The Grenadier Guards One time 1st Foot Guards. 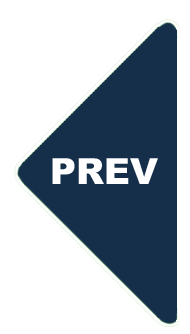 The Royal Cypher and Crown is by far the oldest insignia associated with the regiment. A Grenade. Authorised in 1815 together with the title Grenadier to commemorate the Regiment’s part in defeating the French Imperial Guards at Waterloo. The Coldstream Guards One time 2nd Foot Guards. The Star of the Order of the Garter. 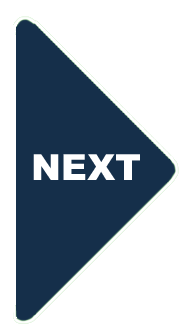 The badge was granted to the regiment by King William III in 1695. The Sphinx superscribed ‘Egypt’, which commemorates the services of the regiment in Egypt, 1801. The Scots Guards One time 3rd Foot Guards. The Star of the Order of the Thistle. The Thistle (of Scotland). The Sphinx superscribed ‘Egypt’, which commemorates the services of the regiment in Egypt, 1801.